There’s a new pattern in the Crochet Spot Store! 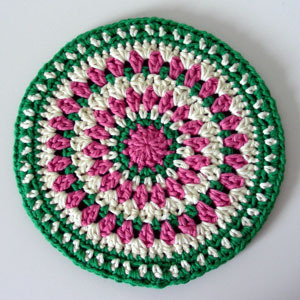 This hot pad pattern is created to match the Kaleido Coasters pattern (also available in the store). The hot pad is made with 2 layers to create an extra thick material to place hot bowls and plates on. The top layer is a fun decorative pattern, while the back layer is solid and simple. The hot pad is also flexible enough so that is can be used as a potholder to remove hot dishes from the oven. It is suggested to use 100% cotton yarn, as other yarns such as acrylics may melt when exposed to high temperatures. This entry was posted on Monday, December 26th, 2011 at 12:00 AM by Rachel Choi	and is filed under Best Crochet Patterns. You can follow any responses to this entry through the RSS 2.0 feed. You can leave a response, or trackback from your own site. lovely, looks good enough to eat. LOVE IT! May be ordering pattern soon! Very pretty! I made one similar, but I added a layer of quilting batting between the two layers…making it extra thick. The only thing with doing this is that the crochet work needs to be fairly closed (no open spaces for the batting to poke through). I also sewed two or three rounds through all three layers so I could throw it in the washer and not have the batting ball up inside; which can be done either by machine, which is what I do, or by hand with needle and all purpose or quilting thread. Love your patterns Rachel. Thanks!! !